My n8000's power button is bad. Sometimes the button can go in and not go out,i need a pin or something small (of course it's sharp) to get it out and it scratches the button. Beside that the back of it is always slightly opened and can't be closed,but its obviously not noticeable with a case that i use. Sometimes the screen is touched by itself. To be honest the S voice is horrible. The charger cable is also bad because it keeps breaking,its my 4th charger cable right now. Some metal frames near to the propetary charging port and the s pen turned white! Dear sir my Samsung Galaxy note 10.1 almost 5 years working good but suddenly is not working what is the reason please help me sir. I have samsum galaxy note 10.1 witch I use since 9 manth with good condition but Now he have charge problem .he take Charging in 1 hours 5 persent but that time Remove charge Note showing low battery. Kindly Tell What Is Problm. 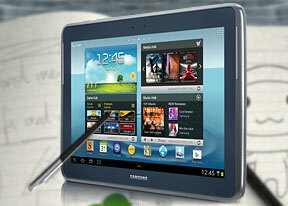 A great device by Samsung. I have been using N 8000 since four years. Never had a problem with this. Tried some other brands also but nothing can beat this one. Only con is this one is little heavy. But Note 8000 is the best. Good camera,good graphics, good display, good ram Everything is great. I'm trying to find away to have the phone in the galaxy note 10.1 turned on.. can some one please help me..
- every time I turn on the driving mode, after while it turns off automatically. When connecting a BT Headset (not samsung) or the normal headset, the caller name and details doesn't transferred to the headset! AnonD-137928, 20 Apr 2013Samsung seems to not realize that their Note 10.1 would be a prime device that all academic (a... moreYou can try using chromecast for connecting n8000 to your tv. Pls can anyone help to explain the major difference between this devise and the smaller note 2, apart from the size. I surely need one of the two. Thanks. How do I connect usb flash drive to the NG8000 tablet in order to import things like movies or documents from a computer? AnonD-100829, 14 Jan 2013The display it's 1280 x 800 because the Wacom technology don't admit more tan this resolutionWacom makes 1080p digitizer screens, but they are prohibitively expensive.